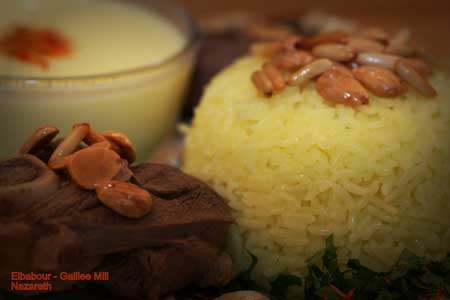 Mansaf is a dish that combines meat, rice and cooked yogurt. It is a festive dish, served at big events such as engagements, baptism and circumcision, and traditional weddings. The dish is served in a large baking tray (a mansaf in Arabic) with all the ingredients common in Arab cuisine – bread, rice, yogurt, almonds, pine nuts, parsley, and minced lamb meat. For a truly Nazarene meal, based on local produce, you can swap rice for freekeh or bulgur wheat, which is grown in the Galilee region. * It is also advisable to buy saffron, which gives color to the rice and yogurt.